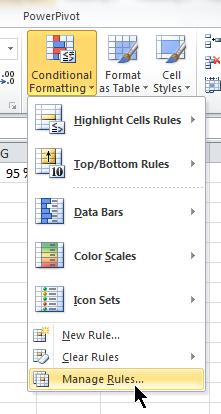 Conditional Formatting Controlled via Slicers! Yes folks, we’ve seen all manner of parameterization by slicer. We’ve even seen sort by slicer. But now it’s time for me to track down a hunch I’ve had for awhile now: we can also control conditional formatting via slicers! Cube Formula Used to Capture the [Selected Min CF Bar] measure value. Note how it references the Slicer too, otherwise it would always return 95%. Note the Circled Buttons! Those are Refedit Controls! The Thresholds in the CF Rule Can Be Cell References! Or at least, I think it’s a bug. Yes, I realize that it’s expecting an integer like 90 rather than a percentage value like 0.90 which is what my measure returns. But I get this error message even when I just type the number 90 into a cell and then reference that cell. But it works if I just type 90 directly into the refedit control rather than a cell reference, it works. Something is broken here. In order to use the Number option to let the user control percentile-based conditional formatting with a measure like [Profit], however, I need to get a bit more sophisticated with my measures. I need to calculate, for instance, what the 90th-percentile [Profit] value is. And that’s what I did. But I’m out of time for today’s post. So the full explanation must wait until Tuesday, sadly. ***UPDATE: The second installment of this technique is now posted here. Yes! Use this technique to dynamically set upper and lower limits for conditional formatting choices that are not color fields. Build two measures instead of one, and you have complete control over stoplight icons from a slicer or two. Next step – combine these measures with other variables in slicers to build visual what-if views (If I increased distribution to X% without exceeding 100%, which products would contribute the most incremental units? Now show them to me with highlighting!). PowerPivot is the ultimate playground, and Rob just keeps dumping toys on the field for all to use. Nice work! What about making diferrent conditional formating depending on what slicer combination you choose? Is it posible to do that?